(Nanowerk News) European scientists have made ground-breaking discoveries for improving the efficiency of the production of pharmaceuticals through plant biotechnology. Biotechnological production offers a cost-effective and environmentally friendly alternative to the chemical synthesis of rare and complex pharmaceutical compounds currently isolated from plants. The results have been achieved in the European SmartCell project coordinated by VTT Technical Research Centre of Finland. 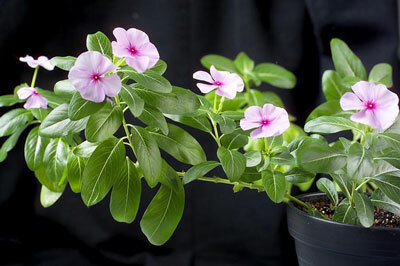 Several expensive anticancer alkaloid blockbusters used in chemotherapy, such as terpenoid indole alkaloids - vinblastine and vincristine, are currently extracted from the plant Catharanthus roseus (Madagascar periwinkle) at high price. These compounds are used to treat Hodgkin's lymphoma, breast cancer, small-cell lung cancer and leukemia. Typically, very low levels accumulate in plant tissues, but chemical synthesis is not an economical alternative either due to their highly complex structures and specific stereochemical features. Internationally, much effort has been invested to develop more accessible and cost-effective sources of these drugs. The main source of vinblastine and vincristine is the Madagascar periwinkle (Catharanthus roseus), also known as an ornamental plant. The SmartCell Consortium succeeded in elucidating the complete upstream segment of the biosynthetic pathway leading to these valuable anticancer pharmaceuticals, and thus creating the basis for their biotechnological production. The biotechnological production of high-value plant-derived compounds using plant cell cultures is an attractive and sustainable alternative to extraction from whole plant material. However, the biosynthetic pathway leading to these compounds in plants is long and complex, with multiple enzymatic steps that are still largely uncharacterized at the genetic level. One of the main goals of the European Consortium SmartCell was to unravel the metabolic pathway leading to the periwinkle terpenoid indole alkaloids. The SmartCell Consortium succeeded in elucidating the complete upstream segment of the terpenoid indole alkaloid biosynthesis pathway, as described in a ground-breaking article published in the journal Nature Communications ("The seco-iridoid pathway from Catharanthus roseus"). The complete pathway of twelve enzymes was reconstructed in tobacco plants, paving the way for cost-effective production of diverse therapeutic compounds. Moreover, cell culture technologies were developed, and the cultivation of the plant cells was scaled-up using bioreactors at VTT's pilot laboratory in Finland. "The use of plant cells as real green chemical factories is now becoming feasible for the first time. The technology developed and the experience gained on terpenoid indole alkaloids in this project can be utilized and applied to other compounds and plants as well", says the project coordinator Dr Kirsi-Marja Oksman-Caldentey from VTT. SmartCell was a four-year FP7 framework project, funded by the European Commission with a total budget of 8.5 million euros. The Consortium was coordinated by Dr Kirsi-Marja Oksman-Caldentey at VTT. It comprised 14 academic partners from leading European universities and research institutes, and four industrial members. The SmartCell project aimed at developing comprehensive knowledge and enabling technologies to control and engineer plants and plant cells for the rational production of high-value plant-derived compounds for industrial use. The findings of the SmartCell project have thus far resulted in a total of 118 peer-reviewed scientific publications.